Adirondack Vacation Guide: Coming Soon: 2008 Saranac Lake Winter Carnival! 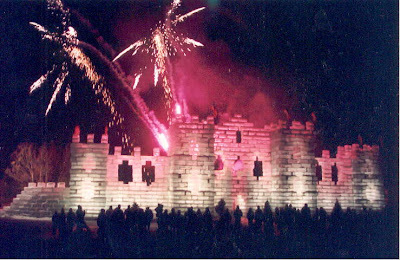 Coming Soon: 2008 Saranac Lake Winter Carnival! A vintage ice castle shot! The 2008 Saranac Lake Winter Carnival is fast approaching. The festivities are scheduled for February 1 - 10 and construction on the 2008 ice palace has begun. This year's theme is Hooray for Hollywood, which should make for some great parade floats. According to the SL Winter Carnival official site, the carnival began "as a one-day event to break the monotony of the long Adirondack winter, the Carnival has grown into a ten-day festival that includes sporting activities, dances, dramatic and musical productions, two parades (one especially for children) and two sets of fireworks above the world famous Ice Palace. In spite of the many changes, the Carnival has retained the warmth, charm and camaraderie of a family and community celebration, replete with reunions of friends and families." This event is the crown jewel for Saranac Lake and is a personal favorite. The parade is a hoot and the ice castle is always impressive, even more so for kids. Come check out the 111th Winter Carnival! View my post on the 2007 Carnival here.